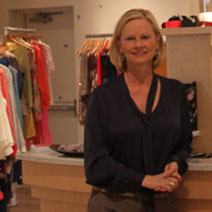 Jane Webb, owner of CK & Co, describes her new store at Nichols Hills Plaza as fresh, modern and inviting. The new store features a lounge area for the gentlemen. Sophisticated shoppers will find all their favorite brands usually available at CK & Co, in addition to some new surprises. Nearly 30 years ago, Jane Webb wrote a business model for a small store her husband Mike wanted to open in Nichols Hills Plaza. She had no experience in fashion or retail, but he said he wouldn’t open the store without her so she put her marketing and advertising degree to work. It was a smart decision for both of them. Mike had grown up in the retail business. His parents owned The Webb, a popular store in Norman that started out selling women’s shoes and later added clothing. The young couple capitalized on the name and opened The Webb in Nichols Hills. A store in Dallas came next. They also operated a shoe department in a high-end specialty store in Houston and owned a Joan Vass store. They even owned a Joan Vass store and brought the designer to Oklahoma City. Jane’s interest in fashion and retail grew and she developed a knack for knowing what customers wanted. Mike turned his attention to other endeavors. She moved the store to the south side of the Plaza, renamed it CK & Co., and slowly expanded as more space became available. They survived economic issues and Jane’s battle with breast cancer. Then came the big decision to build a new store in the same shopping center where they first started three decades ago. First, will you tell us about the new store? We enlarged to 6,300 square feet to feature several separate shop-in-shops. It is well merchandised making for easy shopping. The store features Vince, Theory, Elie Tahari,Lafayette 148 and Tory Burch shops. We still carry many of the same lines as well as some new offerings. The store is modern with tall vaulted ceilings. A Venetian glass chandelier anchors the back of the store over a lounge for husbands to watch games while their wives shop. Any new clothing lines or additions to the mix? We are offering more of a selection in the best of the best. We are always adding new lines to the mix while focusing on what we do best. What feature or detail was an absolute must? The shop-in-shop concept has not been done in Oklahoma City in specialty stores so we feel we are a pioneer in this concept. We have had great support with these designers and they are looking to our concept as a business model for future endeavors. You and Mike built a new store and stayed in Nichols Hills Plaza. Was that always the plan? I have always been loyal to Nichols Hills Plaza. This will be my 30th year in business. I live in the neighborhood and want to support the area. My plan has always been to stay in Nichols Hills Plaza. Mike has not been in involved in the store; however, he has a business consulting company, Business Savvy, where he helps start-up companies put together strategic plans and helps them raise capital. He has had an entrepreneurial nature all of his life. He encouraged me to go forward with this concept. His participation was to help with negotiation of the lease and design ideas. How do you feel each morning when you walk in the door? This store is about the next 30 years. It’s inviting, fresh and modern, and offers shopping that will rival any big city. We have sophisticated shoppers in Oklahoma City and we have given them a reason to spend their dollars locally. CK & Co.’s grand opening party will be from 6 to 8 p.m. Sept. 6. Live music, cocktails and appetizers are planned.